Greenville, OH, April 17, 2018 – The April 12th meeting of the Greenville Business & Professional Women’s Club was hosted by the Membership committee with Sonya Crist, Chair and committee members Tammy Dietrich, Annette Saunders, and Peggy Foutz at the Brethren Retirement Center Brick Room. Sherrie Foster, Scholarship Chair, introduced scholarship winners Kylie Lyons, Sydney Anderson, and Grace Coakley who attended. They each introduced their family members who attended with them. Peggy Foutz introduced speakers, Lauren Roetgerman and Erica Oldiges. Lauren and Erica spoke of their journey through childhood, high school and college and their decision to start a premium athletic Christian clothing line, Almighty One Athletics. Lauren spoke of praying during her runs and had a vision from God to pursue this venture. It incorporates her love of sports, art and Faith. Of course, she had to include her life-long friend Erica in this new mission. 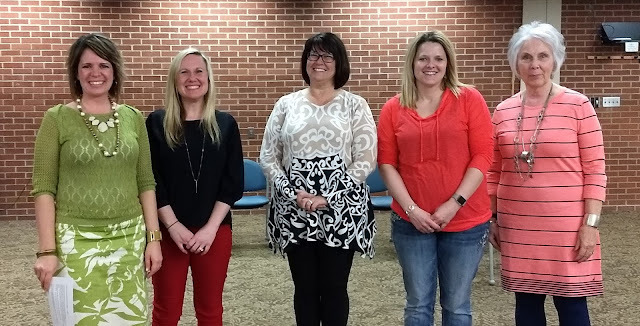 Committee Chair, Sonya Crist welcomed and inducted new club members, Kristina Heath, Loure Bohn, Holly Comley, Desteni Mason, Tammy Dietrich, Kathy O’Dell, and Louisa Kennedy. Each received a packet of seeds and were reminded that they are a part of a thriving organization that makes a difference in the lives and careers of our members both locally and nationwide. The Greenville BPW Club’s mission is to achieve equity for all women in the workplace through advocacy, education, and information. The Club holds fundraisers through the year to raise money to grant scholarships to the young women of Darke County. The Club meets the second Thursday of every month for a dinner meeting. Those interested in learning more about the Club can contact club President, Brenda Miller at 937/423-7552 or brenda@newmadisonpubliclibrary.org or you can find them on Facebook at Greenville BPW Club.